Audi's always been more forward-thinking with in-car tech than most automakers, but it's about to take it to a new level(s), judging by its latest concept car. Our colleagues at Autoblog just took at look at the Prologue, and what it's lacking in green tech, it more than makes up with slick technology on the inside. To start with, the driver gets a "three-level" simulated 3D cockpit, with one showing crucial driving information and two simulating visual depth. Audi says that makes the mass of driving, vehicle, navigation and entertainment information "better organized and easier for the driver to comprehend." The pilot and passengers can control all that data via a dizzying array of touch displays. 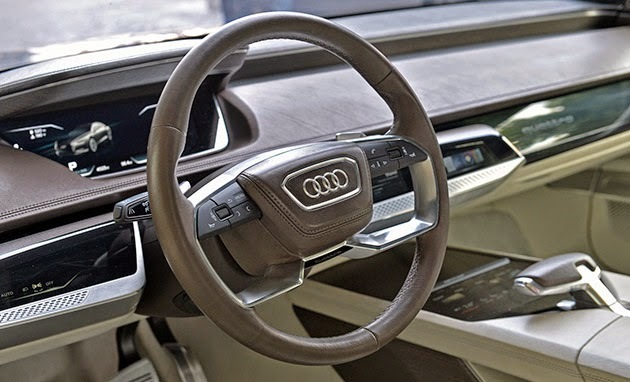 There's one to the left of the steering wheel for lighting and assistance, another to the right for media controls and a wide-screen passenger touchscreen covering the full surface of the instrument panel. With that, the co-pilot can control the tunes and send navigation information over to the driver's display with just a swipe. Finally, there's a fourth touch display in the center console that permits handwriting input (!) and is used for climate control and other vehicle settings. Also new is the sculptural form of the air intakes under the headlights - the distinctive air intakes have diamond pattern screens in their interiors. A dynamically contoured blade, which is clearly separated from the bumper by a gap, elicits associations to motor sport. Mounted to it are two additional spoilers in glossy black, which give the show car an even stronger and wider stance on the road. In side profile, its flowing silhouette expresses the character of forward motion in the Audi prologue. Balanced proportions put equal emphasis on the front and rear wheels - a clear reference to the quattro DNA of Audi. The powerful 22-inch wheels are set in widely flared wheel arches. They are fitted with tires of size 285/30. Each wheel's ten intertwining Y spokes project a filigreed, three-dimensional and powerful image.